In a six-month study conducted among metabolic syndrome patients (diabetes, high cholesterol, elevated blood sugar, obesity) in Japan who were taking multiple prescription drugs (statin cholesterol-lowering drugs and blood pressure-controlling drugs — diuretics, ACE inhibitors), a proprietary nutriceutical (Longevinex®) produced a major health benefit over and above that provided by prescription drugs — improved ability of arteries to widen (dilate) with increased heart rate and blood flow. Drs. Haime Otani at Kansai Medical University in Moriguchi, Japan and lead researcher Dipak K Das at the University of Connecticut Medical School, say “currently available pharmacological drugs are frequently not sufficiently effective.” They go on to say: “A salient finding of the present study is that the improvement of endothelial function was observed in patients taking Longevinex® whose disease conditions were already being managed by standard therapy for lifestyle-related disease.” The endothelium is in inner lining of arterial walls that controls arterial diameter and blood flow. The study involved 34 patients, half of whom took Longevinex® for 3 months while the others took a placebo, and then both groups switched and received Longevinex® or the inactive placebo pills. The positive health effects produced by Longevinex® followed the group that was taking the pill with active ingredients. Neither group knew which one was taking the pill with active ingredients. Longevinex®, providing low-dose microencapsulated/micronized resveratrol and other polyphenols produced a 40% greater increase in flow mediated dilatation (4.4% to 10.0%) than a prior human study (4.1% to 7.7%) that employed a much larger dose (270 mg) of plain resveratrol among a similar group of subjects who were not taking prescription medications. The very earliest sign of blood vessel disease is inability of blood vessels to widen as the heart pumps faster and blood flow increases, a phenomenon called flow mediated dilatation, which was first described in 1933 and first measured using modern methods in 1992. To measure flow mediated dilatation requires a pressure cuff that is applied to the forearm for a few minutes to impair blood flow and then relaxed, which results in rapidly increased blood flow and the release of a transient gas called nitric oxide that dilates (widens) blood vessels. A key ingredient in Longevinex®, resveratrol, is known to produce nitric oxide. Flow mediated dilatation controls blood pressure when the heart rate increases. 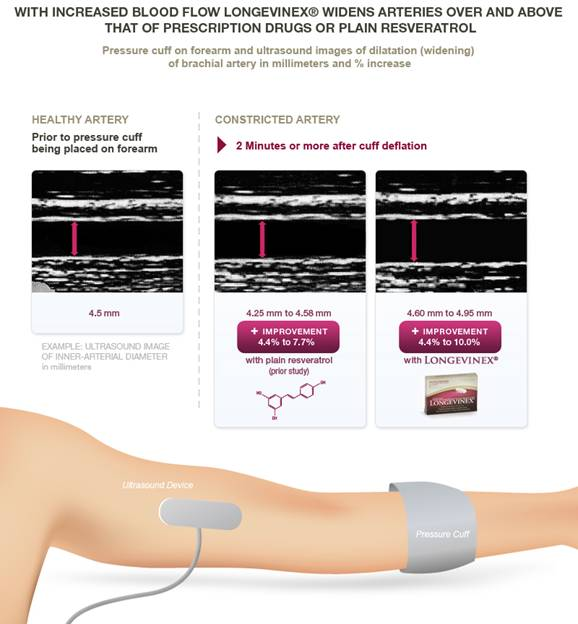 An ultrasound device measures in millimeters the ability of an artery in the forearm to dilate. Essentially the test measures arterial stiffness which actually precedes plaque formation in arteries. Smoking (even second-hand smoke), elevated blood sugar and circulating cholesterol are known to impair flow-mediated dilatation. Estrogen, magnesium, the amino acid arginine and red wine are known to enhance flow-mediated dilatation. Cholesterol-lowering drugs and ACE inhibitors are known to reverse impaired flow-mediated dilatation. Studies measuring the effect of wine upon flow mediated dilatation provide mixed results have been inconclusive. This could be due to the wide variation in content of red wine solids (polyphenols) such as resveratrol, quercetin and catechin, the most commonly-found molecules in red wine. Age-related or disease-related decline in flow mediated dilatation is also predictive for arterial plaque that can impair circulation and induce stoppage of circulation to the heart and brain. In fact, flow-mediated dilatation is considered a way to evaluate artery-unclogging drugs. Favorable blood flow mediated dilatation measures are also predictive of survival following a heart stoppage. The results of this study were published in Nutrition Research November; Volume 31(11): pages 842-7, 2011. Nutrition Research 2011 Nov; 31(11):842-7. Fujitaka K, Otani H, Jo F, Jo H, Nomura E, Iwasaki M, Nishikawa M, Iwasaka T, Das DK. Second Department of Internal Medicine, Kansai Medical University, Moriguchi 570-850, Japan.